Winner of a Dove Award, Moms Choice Gold Seal, and Disney's iparenting Award, Dawn Stephens works daily as the principal of Central Christian Academy. (A prestigious Chrisitan school for 2.5 yr olds through 6th grade). She was a Virginia public school teacher for over ten years and has helped several school systems develop curriculum and teaching material for state tested standards in fun and developmentally appropriate ways. She has owned and operated a business where she provided schools across the country with materials. She has worked as the national Director of Sales for Thomas Nelson Publishers (Nashville, TN) and marketing director for SONDay Enterprises (Williamsburg, KY). She develops and designs books and educational material for schools in the USA and missionaries around the world. 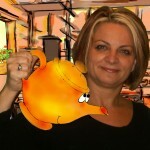 She also writes and illustrates award winning Childrens books. Her passion is to make learning fun for students. Her most popular works include: "Janbatis ak Jozyann Refe," "Mother Goose meets Mother Nature" and "The Little Pot Book Series." She speaks and gives workshops to administrators, churches, teachers, and students of all ages.